Designed to meet the rigorous demands of the cleaning pro, the SIMPSON PowerShot is very powerful, yet extremely compact, easy to transport, set-up and load. Perfect for contractors who specialize in deck cleaning, wood restoration, paint preparation, graffiti removal, and all other professional cleaning services. Simpson PS3228-S PowerShot is a good option for people that are looking for gas pressure washer which can produce high power capable of removing stubborn stain. If you prefer gas pressure washer, read on to know more about this pressure. Simpson PS3228-S PowerShot comes with a Honda GX200 OHV engine which is known for their high torque generating capacity and amazing output. The engine which features oil alert is capable of generating 3200 PSI 2.8 GPM. The oil for the engine is included in the pack. So, when you get your order, you will have to fill the tank with gas after assembling it. One good thing about the engine is that it runs smoothly. The sound is good for a gas powered engine. The power generated by the engine will be able to deal with tough stain. It makes cleaning easy and thus eliminating the stress and rigorous demands associated with cleaning projects. The weight of Simpson PS3228-S PowerShot and the power produced by the engine make this best pressure washer a suitable option for professionals, contractors as well individuals for household cleaning. It weighs 84 pounds. It has two big tires which can be used on a number of terrains. The tires also enhance the mobility of the pressure washer. Thus, the 84 pounds will not constitute any problem to you. You will be able to manage it and move the unit to and from as you are cleaning with it. 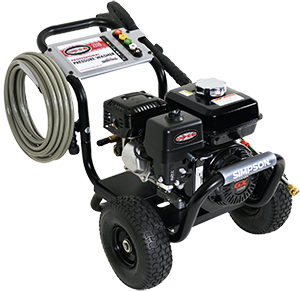 To ensure that users have enhanced cleaning experience, Simpson equipped this model of their pressure washer with AAA industrial triplex plunger pumps. The piston of this feature is coated with ceramic. With this, the machine is capable of delivering a good amount of pressure at the tips making it possible for the system to get rid of any dirt, stain, grease, oil and the likes. It can be used for wood restoration, deck cleaning, graffiti removal, painting preparation, mold and mildew removal and other cleaning projects. 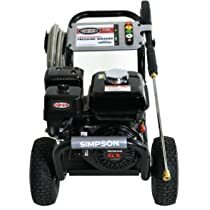 This model of Simpson pressure washer comes with a lengthy pressure poly-braided hose. With the 25 foot hose, you will be able to cover a large portion if not the entire parts of the objects or surfaces you are cleaning. The pressure washer is made to meet different cleaning needs thanks to the 5 stainless steel quick connect nozzle tips in the pro-style, pro-steel spray wand. It delivers a lot of power capable of getting rid of any stain. It is easy to fuel. The engine works fines and starts very easily. It comes with multiple tips to suit different cleaning needs. Simpson has not been able to overcome the gas odor which is associated with new gas powered machine. The window for viewing the oil level is not made with a glass; instead, it is made with plastic material. Some consumers in Amazon have complained about the pump being of poor quality. Simpson PS3228-S PowerShot is a reliable pressure washer suitable for professionals and home cleaning. Though, it has got some negative feedbacks in Amazon, but they are negligible considering that many consumers have rated it high. Do you want to know more about various brands of pressure washers or the options available to you? Visit our site to read informative reviews.